Anyone on Instagram has seen jade rollers in the hands of influencers and on flat lays with high end facial products. These trendy beauty tools aren’t new, and with the weather heating up soon, rolling smooth and perpetually cool jade over your skin may be just what the doctor ordered. What Do Jade Rollers Do? Used by ancient empresses going back thousands of years, Jade rollers improve circulation and collagen production. By activating the lymphatic system, they can decrease puffiness (even around the delicate eye area!). Some say they help skin care products penetrate the skin when you apply before rolling, and others tout the anti-inflammatory effect of a cool jade massage. The jade roller makes an appearance in treatments by celebrity estheticians like Cecilia Wong in NYC, and it’s a simple tool you can use at home for 10 minutes a day for noticeable results. Jade rollers come in different shapes and sizes. Some have two-sides and one with a textured end. This design is ideal for enhancing collagen production. Some double rollers have a large end and a tiny end. The tiny side is great for delicate eye area! Some rollers aren’t even made of jade but semi-precious stones like Rose Quartz or Agate. 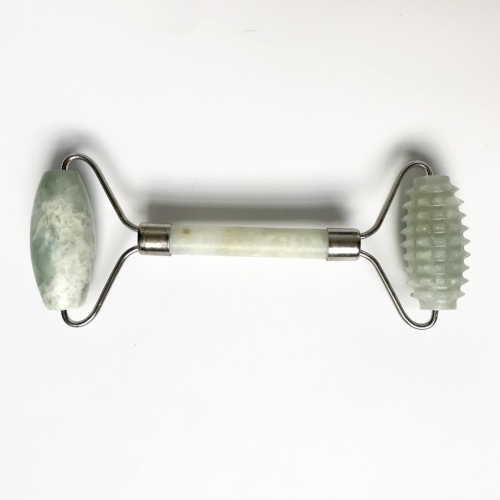 Any type of jade roller you choose will help your skin be calmer, less puffy, and glow! If you don’t have a jade roller yet, check out the rollers at Emerging Energy. These Roller Kits include how-to quick instruction guide, goji glow facial oil, plus a roller all packed in a sweet cloth bag (great for storing your roller!). Dr Mary Claire Dilks is a Doctor of Acupuncture and Oriental Medicine, and owner of Emerging Energy Acupuncture in the Jewelry District in Providence. She has also been named Best Of RI ("Best Inner Healing"). Visit her at www.emergingenergy.net. ***This post has been updated and revised from one that appeared previously on the blog.